This season the Seattle Repertory Theatre offers braille programs and audio-described performances for its theater goers. “The Queen is dead, long live The King!” After a lifetime of waiting, Prince Charles finally ascends to the throne, flanked by wife Camilla, sons William and Harry, and daughter-in-law Kate. The Prime Minister proposes legislation designed to restrict the freedom of the press, which the newly crowned sovereign opposes, subverting the understood rules of British democracy. Written in blank verse, this smash Broadway and West End hit and the 2015 Olivier Award winner for Best New Play presents a modern take on the future of the British Royal Family. For expanded information about the plot, visit the Seattle Public Library’s Shelf Talk: Seattle Rep’s KING CHARLES III: Beyond the Theatre. The Seattle Public Library has prepared a reading reading list for those who wish to do more extensive background reading. King Charles III runs through December 18. The audio described performance is at 2 PM on December 3, 2016. The performance is approximately two hours 40 minutes with one intermission. 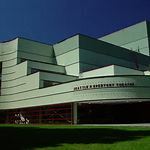 The Seattle Repertory Theatre is located at the Seattle Center, 155 Mercer Street, Seattle 98109. The groups are free with hands-on studio sessions. Guest artists often demonstrate tactile arts techniques. Over the years, Stone Sculpting, Ikebana, Collage, Clay Work, Jewelry Making, Pottery, and Painting with Tactile Elements have all been explored! The Tactile Art Group with Hjylimar Hinn created the braille Faces Mural on the new Artspace Building adjacent to the Mt. Baker Light Rail Station. The mural spells ART in giant braille lettering. To sign up for the June 16th group, please e-mail info@visionlossconnections.org or call (206) 282-3913. Looking forward to great creative energy during the summer months! The Sound of Music is one of the most beloved musicals of all time and celebrates the 10th Anniversary of Vision Loss Connections offering affordable tickets to Audio Described Performance at the 5th Ave Theater. Enjoy this fabulous Holiday show, with full orchestra and a stellar cast of Seattle Favorites. You’ll leave the Theater humming such memorable songs as, “My Favorite Things”,”Do Re Mi”, and of course “Climb Every Mountain”. The Sound of Music 2005 production was the first show where we organized a group with Kay Holdaway from United Blind of Seattle suggesting the idea. Marilyn & Miles Otoupal later enthusiastically embraced the concept and helped to fund the program. Those were the early days and unfortunately Kay and Marilyn are no longer with us in life, but this is a time to especially honor and remember them. Tickets for Sound of Music through Vision Loss Connections are $25.00 per person for a person who is Visually Impaired and you can also purchase one additional ticket at $25.00 per person for a friend or family member. Join us for lunch before the show in a private dining room at the Rock Bottom Restaurant 1333 Fifth Ave. which is located right across the street from the Theater. With a group, you want to allow a little more time for ordering lunch. Plan to arrive around 11:15AM for relaxed dining. If you are using Access Para-transit we recommend that you arrange your pick up window after the show for 5:15-5:45PM at Starbucks 1318 4th Ave. Seattle WA 98101 which is one block west of the Theater. Returning theatergoers can also arrange for payment with cash or check at lunch at the Rockbottom Restaurant, on the day of the show. Tickets can be picked up at lunch or at the Theater Box Office under your name on the day of the show. Where: Play is at the Fifth Ave. Theater, 1308 Fifth Avenue. Lunch is at the Rock Bottom Restaurant, 1333 Fifth Avenue. The restaurant which has a moderately priced menu is across the street from the theater. Access Pick Up is at Starbucks, 1318 4th Avenue (corner of 4th Avenue and Union Street). Vision Loss Connections invites you to celebrate the 25 Year ADA Anniversary with a free 5th Avenue Theater Tour and Introduction to Audio Description on Monday, July 27, 2015 at 1:00PM. -Learn about the Art of Audio Description which makes theater accessible to visually impaired audience members. -Learn more about the 5th Avenue Theater’s state-of-the-art Sennheiser infrared FM True Sound System. To reserve a spot on the Theater Tour, E-Mail or call (206) 282-3913. The 5th Avenue Theater at 1308 5th Avenue, Seattle WA 98101 is located on the east side of 5th Avenue between Union and University Streets. The Seattle 25th Anniversary Americans with Disabilities Act (ADA) Logo was created by Seattle Artist Leyah Sayler who is visually impaired. Following is a verbal description of the logo. Goalball is an active team sport of Blind and Low Vision Athletes. Vision Loss Connections’ Seattle King Cobras Goalball Team, United States Association of Blind Athletes, invites you to come and experience Goalball. The February 19th, Tactile Art Group is going to Edmonds Community College for the Please Touch Exhibit and lunch afterwards at Claire’s Pantry in Edmonds. Jim Ballard who works with the Tactile Arts Group has curated this show which highlights the beauty of Touchable Art with Braille Description. Tactile Art Group Members, Ann Fagan, Ezzie Hernandez, Stacy Thurston and Becky Bell have created work in the show. The Tour and Transportation to Edmonds is free with pick up locations at Benaroya Hall Lobby at 3rd & Union St. and Seattle Artist and Craftsman Supply, 4350 8th Ave. NE Seattle WA 98105. Time: 9:45 AM Pickup at Benaroya Hall Lobby near the Starbucks in Downtown Seattle. 10:00 AM Pick Up at Seattle Artist and Craftsman Supply in the U-District. To reserve a spot on the Tour E-Mail or call (206) 282-3913.
with a drop off window 9:30AM – 10:00AM. If you are returning home with Access we would suggest: a 3:00PM – 3:30PM pick up window at Seattle Artist & Craftsman Supply. Claire’s Pantry is a moderately priced restaurant in Downtown Edmonds known for serving Good Comfort Food, Turkey Pot Pie, Great Burgers and their own roasted Gobbler Turkey Sandwiches. Claire’s is located at 301 Main St. Edmonds WA 98020. The Please Touch Exhibit is located at the Art Gallery in the Edmonds Community College Library Building, 20000 68th Ave. West Lynnwood, WA 98036. Here is a short description of the Exhibit. You are invited to come and learn the Art of Collage from Elisa O’Neil, a visually impaired artist who uses textured paper and bold contrast to create her artistry. Classes, which are free, are specially geared to the creative needs of visually impaired children and youth. The studio sessions will be great fun and family members and teachers are especially welcome to attend. The classes will teach the art of collage and painting using acrylics with tactile elements to create layered designs meant to be touched. 4350 8th Avenue NE, Seattle WA 98105 (in the University District near Petco). To register or confirm that you will be attending please reply to this e-mail or call Patt Copeland at (206) 282-3913. This program is made possible by a special grant from the Seattle Office of Arts and Culture. Enjoy this special Free Access Tour of the Miró Exhibit at the Seattle Art Museum. Enjoy lunch at Von’s Restaurant after the Tour! Von’s is located at 1221 First Avenue right across the street from Seattle Art Museum at the corner of 1st Avenue and University Street. Enter the Museum at the Union Street entrance after 9:30 AM. If you are using Access, the pick up spot for Von’s is the same as Seattle Art Museum.